The ONE Campaign has joined forces with dozens of musicians from across the globe to launch agit8, an urgent call for action against extreme poverty in the crucial week leading up to the G8 summit in Northern Ireland. An extraordinary line up of artists have added their voices to the campaign by recording brand new versions of great protest songs, because protest leads to progress and bold commitments from world leaders could be life changing. 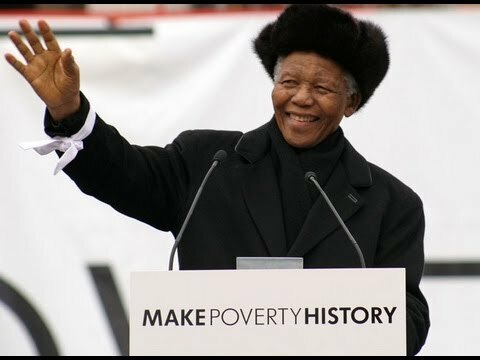 Bono, co-founder of ONE said: “This week we are reminded of the words of the great agitator Nelson Mandela – “Like slavery and Apartheid, poverty is not natural. It is man-made and it can be overcome. Millions of people… are trapped in the prison of poverty. It is time to set them free. Sometimes it falls upon a generation to be great. You can be that great generation." Since the 1970s, Nelson Mandela has called upon artists and bands to use their platform to fight injustice. We were honoured then, we're honoured now." Ms Kidjo and U2 are joining other artists, including Ed Sheeran, Will.i.am, Mumford and Sons, Elvis Costello, Sting, Green Day, Kid Rock, Rokia Traoré and Macklemore & Ryan Lewis to urge and inspire a new generation to take action in the fight against the injustices of extreme poverty and hunger. Artists from Mali, Ethiopia, South Africa, Nigeria, Algeria, USA, UK, France, Japan, Germany, Italy, Ireland, Canada and Belgium have joined up. Exclusive videos of their brand new performances of iconic protest songs are available at one.org/protestsongs and on Spotify. Throughout history, great injustices like slavery and apartheid have been overcome when public protest became too loud for politicians to ignore. Today, with 20,000 children dying needlessly every day from poverty and hunger, ONE says it’s time to turn up the volume. Urgent action now could bring the virtual elimination of extreme poverty by 2030, but there’s real jeopardy, so we are calling for millions more voices to urge those in power to finish the job. · To boost Africa’s food revolution, putting political momentum and transparent and accountable financial support behind African plans to develop agriculture, fight poverty and prevent chronic malnutrition. · To unleash a transparency revolution so that aid, investment, budgets and financial centres all open up to allow citizens and investigators to stamp out corruption and ensure that tax revenues and other money are not lost from the fight against extreme hunger and poverty. ONE has also collaborated with filmmakers, actors and activists including Richard Curtis, The Found Collective, Chiwetel Ejiofor and People Speak which is run by Colin Firth and Anthony Arnove to create a new 30-minute film which celebrates how protest, and its music, have catalysed change and led to progress over the course of history. The film will be projected onto the iconic Tate Modern in London at 22:00BST on Tuesday, Wednesday and Thursday this week.